A classic, cold-weather drink that will bring back memories of Christmas past? You guessed it: eggnog, with just a hint of nutmeg. This year you can bring it to your favorite mug in a scrumptious dairy-free version. When you add the hot coconut milk, make sure that it is on the outer edge of warm, but not boiling – you wouldn’t want to cook those dreamy egg yolks in the blending process, cause that’s what gives the nog its beautiful creaminess. After all, tempering an egg is easy, here’s how: rather than pour all of the hot liquid at once into the blender, add a small amount and blend, then add some more, blend, and repeat until everything is happily mixed together. 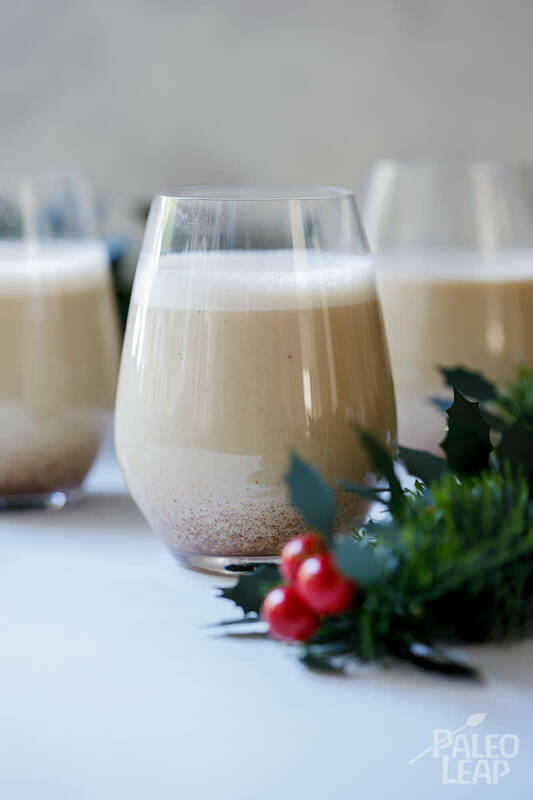 If eggnog is on your list of party drinks, know that it keeps for up to 3 days in the fridge – and if there is leftover, we highly recommend a simple breakfast of crunchy Paleo granola drenched in luscious eggnog. It will be the epic morning feast that gets you all the way to dinner, without the need for snacking those irresistible, and festive, chocolate covered almond butter stuffed dates in between. Mix up the joyful holiday cheer and be surprised at the flavor combinations that you can make when you swap out the coconut milk in favor of almond milk, or go 50/50 with dairy-free substitutes of your choice, or use honey instead of maple syrup… You can even add your preferred holiday spirit – we’ll let you sort that out for yourself. Place the egg yolks, vanilla, maple syrup, nutmeg and cinnamon in a blender and blend for one minute. Pour in the hot coconut milk, then blend 2 minutes longer. Pour into drinking glasses and serve. Alternatively, cool and serve over ice.